The Museum maintains a fleet of historic vessels located on our grounds, and are open for tours and viewing mid-May through mid-October (weather pending). Come Aboard! LT-5 is diesel powered with an engine manufactured by the Enterprise Engineering Co. of San Francisco, CA. The Enterprise DMQ-38 engine is rated at 1200 horsepower at 275 revolutions per minute, drives a single three-blade, 8.4' diameter screw propeller with a 4.5' pitch. The engine has 16" cylinders and a 20" stroke. A large towing winch gear motor, manufactured by the Electro-Dynamic Works of the Electric Boat Co. and the Berson Co. of Superior, Wisconsin, below deck feeds to the fantail for towing. On June 6, 1944, LT-5 left Exmouth, England as part of a fleet of tugs, barges, merchant ships and concrete caissons with the mission of establishing artificial harbors to ensure the steady supply of men and materials needed for the continued assault on German forces. Delayed by heavy winds, LT-5 arrived off the coast of Normandy in the early morning hours of June 7th. After waiting for instructions, LT-5 moored her barges to a sunken LST and began the logistical tasks for which it was assigned. Tugboats were not spared from enemy attack, and as recorded by her logbook entry for June 9th, - "Planes Overhead. Everyone shooting at them. Starboard gunner got an F.W." - A German Luftwaffe fighter plane known as Focke Wulf. For the remainder of the month, LT-5 towed barges and landing craft to the artificial harbor code-named "Mulberry A" off Omaha Beach. "Mulberry A" - the American harbor - was completed on June 14th (D-Day +8), and in just four days had landed 11,000 troops, 2,000 vehicles, and 9,000 tons of equipment and supplies. Post War - After remaining in service throughout the war in Great Britain, LT-5 returned to the United states and was assigned to the Buffalo, NY District of the U.S. Army Corps of Engineers in May, 1946. At that time, LT-5 was renamed the John F. Nash. 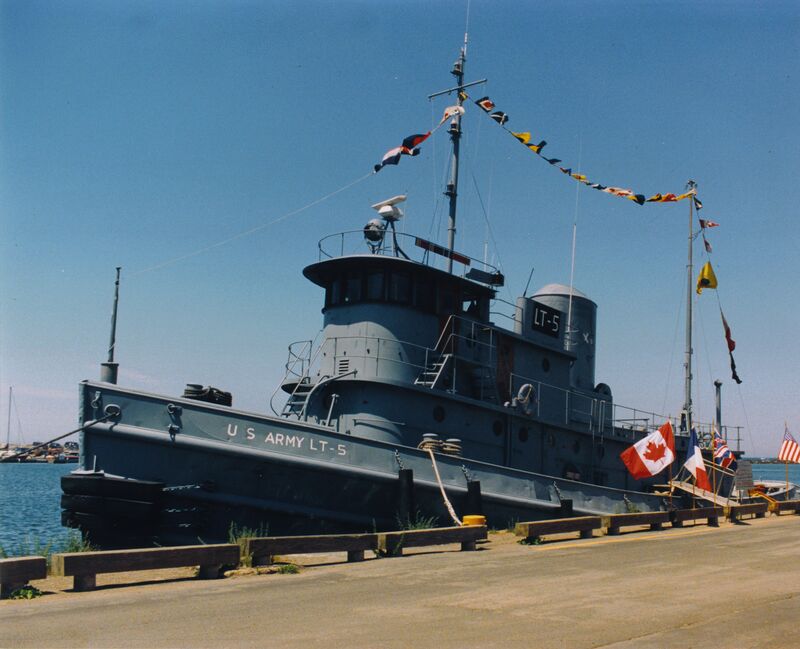 LT-5 served from 1946-89 in the lower Great Lakes region assisting in the maintenance of harbors, and worked on construction projects including the St. Lawrence Seaway in the 1950s. When deemed excess by the USACE in 1989, the Port of Oswego Authority eagerly acquired the National Historic Landmark that is now maintained and operated by the H. Lee White Maritime Museum. *Information adapted from: National Register of Historic Places, Nash (Harbor Tug), Buffalo, Erie County, New York. To learn more about the LT-5, visit the Museum. Or, to see more photographs, click here. Derrick Boat 8 - Given its association with the maintenance of the New York State Barge Canal between 1927 and 1984, Derrick Boat 8 serves as an important example of the bygone steam era reminding visitors of the implications that steam power technology had on the commercial development of the United States, and, therefore, is a striking example of broad historical patterns in American history. Built by the Department of Waterways' Department Forces in 1927, Derrick Boat 8 was appraised at $20,000. According to research, between 1927 and 1958 the vessel was assigned to District-1 Erie, and found port in Waterford, NY. Sometime between 1958 and 1984, the vessel was transferred by the state to Lyons, NY. It was in Lyons when then Canal Section Superintendent David Conroy worked with the H. Lee White Maritime Museum to transfer ownership of the vessel in the wake of its retirement. Derrick Boat 8 was originally outfitted with a coal burning 1927 vertical 85 horsepower Ames Ironworks Boiler and a 1927 100 horsepower, 2 cylinder American Hoist & Derrick Co. engine that powered the vessels derrick. Records indicate several refurbishments and upgrades to the vessel throughout the 1930s and 1940s. For example, in 1938 Derrick Boat 8 was reconditioned changing the fuel type from coal to oil. The advent of a Mundi Swinging Engine and Kohler Electric Plant to the vessels operating system, coupled with all the other technological alterations,represent the technological advancements of the 20th Century. Come board Derrick Boat 8, or to see more pictures click here. 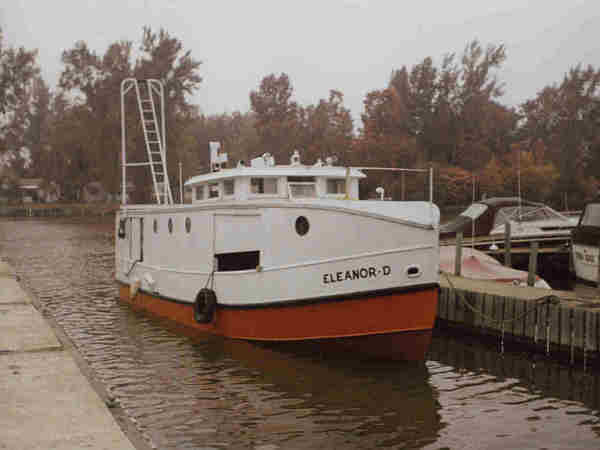 Eleanor D - Eleanor D was built in Erie, PA in 1948 and purchased by William Cahill Sr. and WIlliam Cahill Jr. of Oswego, NY in 1958. It was operated by the William Jr., a third generation Lake Ontario fisherman. The Cahill family operated the commercial fishing vessel until 1979. The 40 ton vessel has a hull built from surplus WWII steel sheeting, has a 5 foot draft, 12 foot beam, a length of 42 feet, and has endured the 25 foot swells not uncommon to Lake Ontario. Dontated to the Museum in 2004, a small group of specialized volunteers led by Don Feck began to stabilize, repair and restore the exterior of the vessel to preserve it for generations to come. Eleanor D is permanently dry-docked at the Museum for viewing. To see more of the vessel, click here.